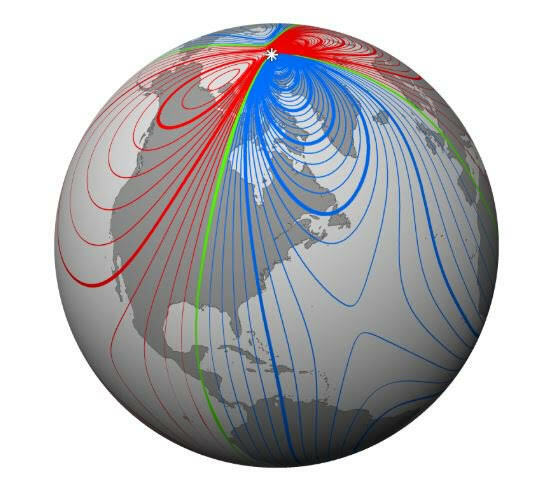 Earth’s Shifting Magnetic Pole May be Confusing your GPS device and mobile phones. Pick up your cell phone and look at it. That rectangular marvel of modern technology contains thousands of lines of code. Among them is the World Magnetic Model (WMM)–a program that helps your phone navigate. And it’s in a bit of trouble. Researchers have announced that the WMM needs an emergency update because Earth’s magnetic field is changing. “When you open your smartphone’s map app, you may see an arrow pointing which way you’re facing, and there’s something quite clever going on underneath.”he continues. “Since late 2014, Earth’s core field has varied in an unpredicted, and currently unpredictable, manner [including a sudden change in declinaton called a ‘geomagnetic jerk‘ in 2014/2015],”says Brown. That’s why, for the first time, they are issuing an update to the WMM before the usual 5 year mark in 2020.